Do the hustle and bustle of the holidays wear you down? 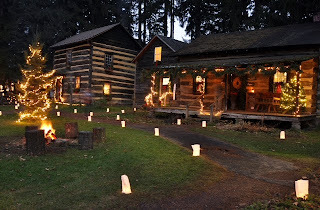 Take some time this weekend to experience a calmer and more meaningful event and visit the Spruce Forest Artisan Village in Grantville for their annual traditional Christmas celebration. Wander through the sparkling village and travel back to simpler days. 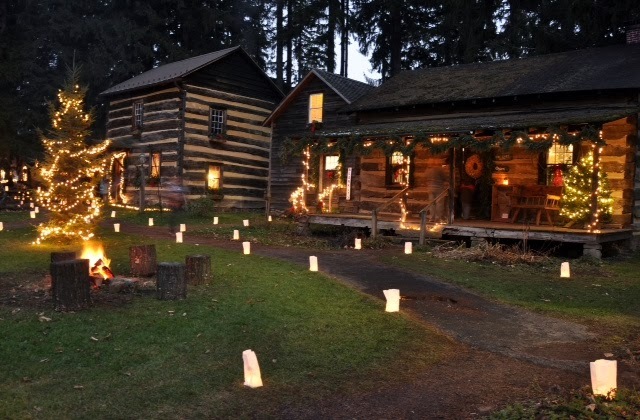 Hosting its 29th year of the event, this Friday and Saturday (December 6th and 7th), guests will enjoy strolling through the village that will feature hundreds of luminaries lighting the pathways, fresh greenery and decorations will adorn the historic cabins which will lead over the Historic Cassleman Bridge. Enjoy warm apple cider in the Yoder House and listen to the hosts as they describe how the first Europeans settled in the area and started some of the first holiday traditions. Walk through each studio gallery to see and buy fine Appalachian crafts, including Lynn Lais’s pottery, Ann Jones’ weaving, Mike Edelman’s ironwork, Douglas Salmon’s metals, Gene Gillespie’s turned wood, Gary Yoder’s bird and feather carving, and guest artists Lenore Lancaster with colored pencil drawings and prints. Local musical talent will add to the festivities as their will be several different artists playing throughout the event. It really is a fun festival that allows you and your family to take a moment to truly appreciate the holiday traditions that have been around for so long. Admission to the event is free although donations are always greatly appreciated. Christmas in the Village takes place from 4-8pm on Friday December 6, and noon until 8 pm Saturday December 7, 2013. For directions or event information, please call the Village office 301-895-3332 or visit www.spruceforest.org. Just another peaceful day at the lake! Wisp still has snow and currently open with 5 trails that are usable. The ice-skating rink and snow tubing park are also both open, as well as the Mountain Coaster. There are definitely a lot of great activities going on this weekend so now is the time to take advantage of some of our great discounts. We can’t wait to see you at the lake! Next Next post: A little help in planning your Couple’s Retreat!